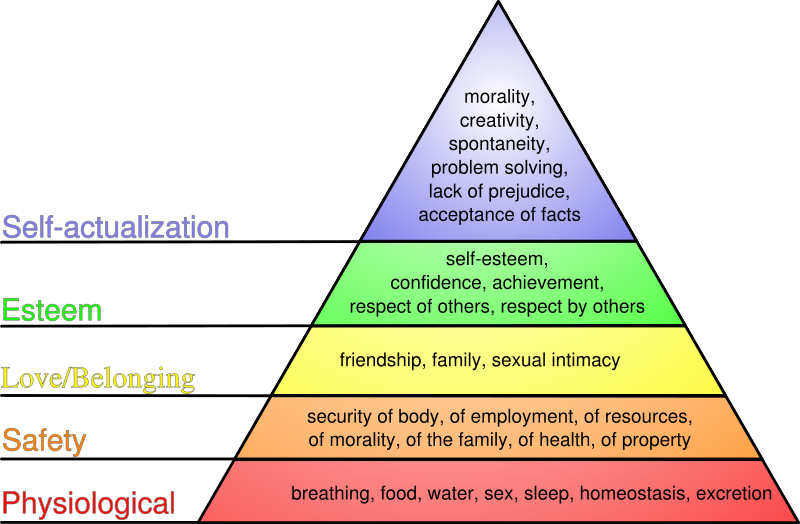 Inverse Relationship Between Hierarchy of Needs & Community?? Maslow' Hierarchy of Needs.....is anyone not familiar with this work?? If not, Abraham Maslow created a system of explaining human needs and wants. Basically, if the most basic physical needs for the body are not met, it is almost impossible for any higher level wants to be satisfied. Like in the survival community, the rule of three's must be met or you die. I will return to Maslow is a minute. The other person I would like to ponder is Gene Roddenberry, the person who created Star Trek. ( http://en.wikipedia.org/wiki/Gene_Roddenberry ) One of the ideas promoted through the many Star Trek series was the evolution of civilizations. Levels 0 through 3, if memory serves. Level zero is a most primative civilization, involved in the daily struggle for basic survival, still at war tribe vs tribe, using limited technology. Where as, a level three civilization would be very technologically advanced, mastering time and energy munipulation, working towards a common good - while still allowing for personal advancement. No longer engaging in destructive practices like war or harmful manufacturing. However, a level three civilization would appear to a level zero civilization to have "god-like" mystical powers of creation and transportation. A level three civilization would be the apex of what is possible to/by physical beings in the third dimension. Has anyone else noticed that we, the peoples of Earth, have attained a very high level of technological advancement?? We can make electricity by splitting atoms. We can go to space. We can transplant organs. We can visit places under the seas. We can fly to work. We can buy breakfast without leaving our vehicles. That is pretty good right?? But, the question starts to creep in....has anyone else ever done this before us?? Are we the first peoples of Earth to get this much technology working for us?? For all of our technology, we do not have a real answer. Many theories about Egyptians, those from Atlantis or even Lemuria. So, let us be reckless with the law of proof and explore this line of thought without rules. Let's suppose we are just another civilization that is at the cusp of the zero and type one civilization. And while all those before us have failed, for whatever reason, we have the possibility of succeeding. What is the main stumbling point for crossing over from Type Zero to a Type One civilization?? I believe it is ego. And directly related is power. In a type zero civilization, power rules everything. The few control the many. The few get rich and the many starve. The few hold the whips of power and the many trudge along bound by the chains of slavery. Today, it is economic slavery - car payments, credit card payments, rent or mortgage payments, and food. That is the weapon of choice around our planet. Those who control the food, control the people. But, power is a reflection of an immature ego. Me, me, me!!! To deflect progress, those in power introduce a dichotomy - us vs them. We are good and they are evil/bad. The redirection keeps the few in power and distracts to many from their hunger pangs. But for true progress, everyone needs to progress. Not just the few. Now let's return to Maslow's hierarchy of needs. As each level of needs is met, it allows the individual to seek to better themselves. The pursuit of personal perfection, in theory makes for better people, right?? That is what I would like to explore today. Does the pursuit of perfection, actually make better people?? Looking at the diagram above of Maslow's work, see that the physical needs need to be met - air, water, food, security, procreation, etc. There is a common theme on the lowest levels of needs, the common denominator is community. Without a community, the individual is unlikely to survive for long. However, as you climb higher and higher, the needs/wants become more personal. During tough times, survival alone consumes much of the available resources of time, energy and focus. But as technology begins to become more widespread, more common place - in theory, there is more time, energy and focus on what do I want or need from this life. So, with more technology we have more time to focus on the self and less time to focus on our community. Which, is where I think we are at this exact moment. It is not so much that people are more selfish and less community minded, it is just for the first time in recorded history we finally have time for ourself. But, this is a transitional period for civilizations. Before someone's ego interrupts our collective advancement to a Type One civilization, we, the peoples of Earth, have to quickly adjust to our collective position of collective power. And quickly, recall that for each of us to advance, no one can be left behind. We need to become active in our community and ensure we all make the advance. As we approach this cusp, we are all enjoying our personal advancement but we must be aware that some will lose their power, their riches, their elite status. These few, will do anything to maintain the status quo or worse...they may instigate a planet wide conflict that will set back all of our progress and technology to an era that the caveman would recognize. It is now, that we must bond together and build stronger communities and a stronger we, the peoples of Earth. The time for currency and wealth and false economies, are soon to be behind us. If we, the peoples of Earth, were to work together to build a better world, as healthier world, we will all be rich. Not a shallow material wealth. But a richness of common purpose and working towards making everyone a part of success. When all the peoples of the Earth work together, there is nothing we cannot achieve.